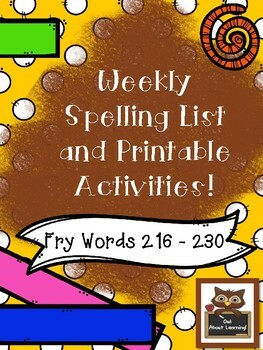 Fun Spelling List Word Work Using Fry Words 216 - 230! 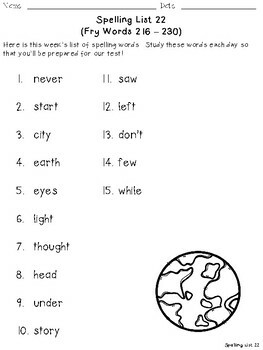 We use the Fry List in our school system for learning sight words and for our spelling program. 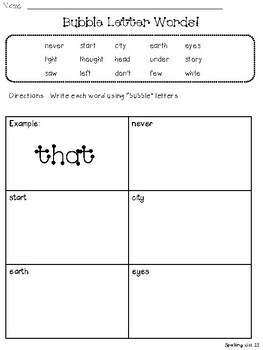 It's important for elementary students to build up their fluency in sight and then in writing when they use these words. The entire Fry List is based on frequency and how often a word would be seen and/or spelled. This and my other products using the Fry List include activities that I do with my 4th Graders each week! I do "pick and choose" so that each week is not the same. There are ten different activities for you to use with your students! You just need to simply pick and choose which ones would be best for your class. 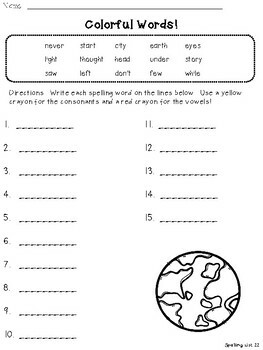 Some of these printables will need to be copied “back to back” because they require a little bit more space for writing. You can check this product out in its entirety by clicking on the "preview" button above. If you have any other wonderful ideas that I could add to this product, please do not hesitate to reach out to me via email and let me know. I’ll see what I can do to make this even better for you! My email is owlaboutlearning@outlook.com. Are you following me? Please click on the "follow me" button above so that you don't miss out on any of my new and/or free products! I'd greatly appreciate your feedback so that you can earn your TpT credits towards free stuff!